The lesson to be learned from this project would be to not leave a garment unfinished for too long time, or if you do, at least keep some record of your seam allowances and fitting adjustments. On the other hand, a project which has problems may look surprisingly promising again after some time has passed... Just prepare to having some work with it! The story begins, as often happens, with aimless wandering in the fabric store. 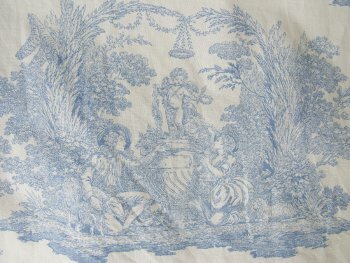 This time it was a cotton print from Laura Ashley that caught my eye. 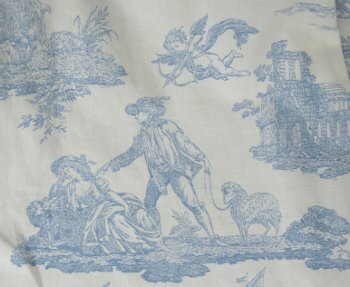 I already have a blouse of the same lovely toile print in mauve, and this blue and white one was clearly meant to become a summer dress. I was stupid (or seemingly wise) enough not to grab it at once, having other more urgent projects at hand, and the next time I went there there was none left. 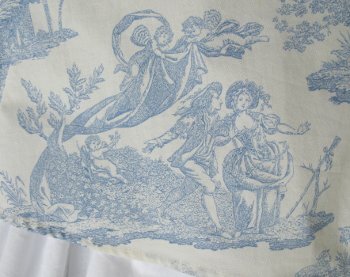 Luckily they still had some in another store of the same chain – when I found the fabric I had already given up hope for, I could not possibly leave it there, right? At first I thought to combine different materials for the dress (light denim perhaps) and maybe throw in some lace. Then I wanted something a bit 50's inspired with big skirt and perhaps tiny puffed sleeves. I also planned to make a wide, corset-like belt in darker blue. My pedantic habit of making quick mock ups might have saved trouble this time too. For the first thing the bodice was way too large, especially at the waist. The material was thin but rather stiff, so the extra width looked bad. The wide belt might easily hide that, but as I tried on a strip of material to get an idea how the belt would look like, I began to have doubts about it too. And the skirt, which was quite wide at my hips, looked terrible. A super fluffy ruffle petticoat might of course make it look nicer, but I was not sure about that either anymore. I tried to pin some of the fullness into pleats, which helped a little. I even begun the ruffle skirt/lining, but as I was left with the impression of a really badly fitting and generally boring dress, and also had more urgent projects to finish, the dress ended up in a plastic bag in the closet. A year passed. One of those first sunny days in early summer (or late winter), when you begin to dream about summer and summer clothes, I suddenly remembered this dress again. I found the plastic bag with the unfinished dress, a heap of material scraps, neatly folded lining material and even the zipper intended for it. I tried it on with some curiosity if my memory served right. Sure it still had problems, but I realized again how much I liked the material, and generally had a better day than at the last fitting and thus didn't hate everything I put on. So, I decided to give it another chance. I had lost some weight, so I had to take in even more than I had thought. This time I was not so fond of the big skirt idea any more, but had a vision of a rather simple summer dress instead. I didn't really want to cut so much away from the skirt seams, so I put the extra width in the hips into large pleats on the seams, only taking some off from the side seams. It worked fairly well. I also cut the hem a bit shorter to get a more easy, relaxed feel to the dress. I made mock up piece for the puffed raglan sleeves, but my first version looked so boring I decided to leave the sleeves and do just shoulder straps instead. Simple straight straps would have been so easy, but of course I got it into my head to shape them a bit. At last I got more or less the shape I wanted, and by that time I wanted to shape the neckline a bit too. At this point I had to decide between adding a lining or not. The material was quite tightly wowen and surprisingly non-transparent for a thin white fabric, but then again, a lining is always the safe option. The piece of cotton batiste I had originally bought for the lining turned out to be too short (as I had planned to make the big ruffles on the hem), but I cut as long lining as I could, planning to add a flounce later. Cutting the lining had one slight problem, however, and that was that I had no idea anymore what seam allowances I had used for the neckline, or how many times I had altered the bocide fit in total and how much and where – I had marked some of my changes on the patterns but probably not all. Comparing the pattern to the dress which might have already stretched a bit on the fittings was not a fool-proof method either. In the end, with some guessing, I managed to cut the lining which happily seemed to fit in nicely enough. But sewing the lining on the neckline was not the end of it. I realised that having originally planned the raglan sleeves, the cut of the armholes was not way too straight to look graceful with the slightly shaped shoulder straps. So, some more sewing-trying on-sewing followed. I also shaped the neckline a bit in the front, and in the end even suddenly wanted to have a v-shaped neckline at the back. I have no idea why, since I always wear my hair open anyway, so details in the back are pretty much wasted. Well, having gotten the idea I shaped the back. 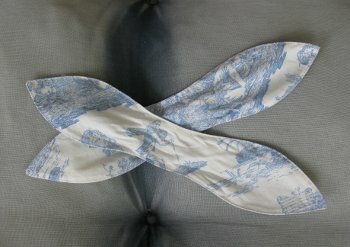 As the body curves inwards between shoulder blades v-shaped back like this easily flaps at the edges, so I stitched a piece of ribbon on the seam, pulling it a bit tighter. Thus the neckline turned out to fit very nicely. So, at last the top part of the dress was finished. As the dress was so very simple now, I wanted at least some detail apart from the pattern, so I made little shaped straps that can be tied on the shoulder straps forming scarf-like bow details. They also work to fasten the bra straps on the shoulder straps of the dress! As they are separate, they are easy to laundry and iron too. For the last thing I bought more batiste (this time a lot of it, as I use this material a lot) and made a flounce to finish the lining. Another lesson to be learned from this project might be that planning you project well saves a lot of work. If I had gotten my final idea at once I can imagine how fast I would have finished this dress. A mock up is much more convenient for planning the neckline shape than a half finished dress. But then again, life doesn't always go the way I had planned either, and I the end, after many ideas and much extra work I got a very nice little dress.